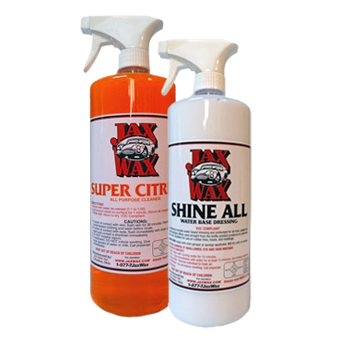 You can do it yourself just like the car dealers do with the Jax Wax Engine Compartment Clean and Detail Kit and a few quarters at your local self-serve car wash.
Every time we have shown someone how to do this, they seem to be amazed at the ease and results of this simple process. Don’t Be Intimidated – it’s really so easy anyone can do it! Other than a better looking appearance, other benefits of a clean engine compartment include being able to detect and identify the source of any fluid leaks, being able to shed heat more effectively, much more pleasant to work on and a lot easier to sell when the time comes. This kit should be able to do 3 to 4 vehicles. This is a precaution in the case on a hot sunny day – you don't want Super Citrus to dry on your painted finish. There is usually enough soap left over on the brush in a self-serve car wash to do the job. 5. Pop in some quarters and select High Pressure Rinse. 6. Spray off the entire engine and compartment. It will appear to be all white and "milky". Don't be concerned – you aren't making a mess! It will dissipate, and produce a nice even coat and dry in the next step! 9. Close the hood and get on the freeway for about 3 to 4 miles. Be the first to review “Jax Wax Engine Compartment Detail Kit” Click here to cancel reply.